[about] | Komala y Stefan - El Tango me ha tocado. For over a decade Komala has been teaching in Europe where she is highly respected. 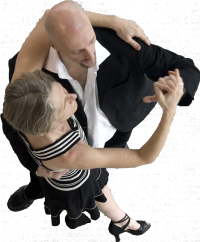 She has a profound knowledge of the body and of the dynamics of tango. Her workshops followers are invaluable to followers who want to know their bodies better and to become more active in the dance, and her other workshops deal primarily with the energy and dynamics of the dance, preparing leaders and followers for a new level of communication. Komala started tango dancing in 1990. She began her professional career by teaching together with Eric Jorissen, founder of the famous tango center, El Corte, Nijmegen, The Netherlands. She is currently a main hostess and teacher of El Corte. After this period of 'just dancing' he started to take lessons again with different Argentinian teachers - among them Nancy y Damian. But the most inspiration he got from his work with Eric Jeurissen & Komala - not only regarding the dance but also the teaching.